On October 22nd 2018 I had a great flight on my Stemme. While it wasn’t a record flight or the longest flight in my gliding career, several factors contributed to me wanting to write about it. 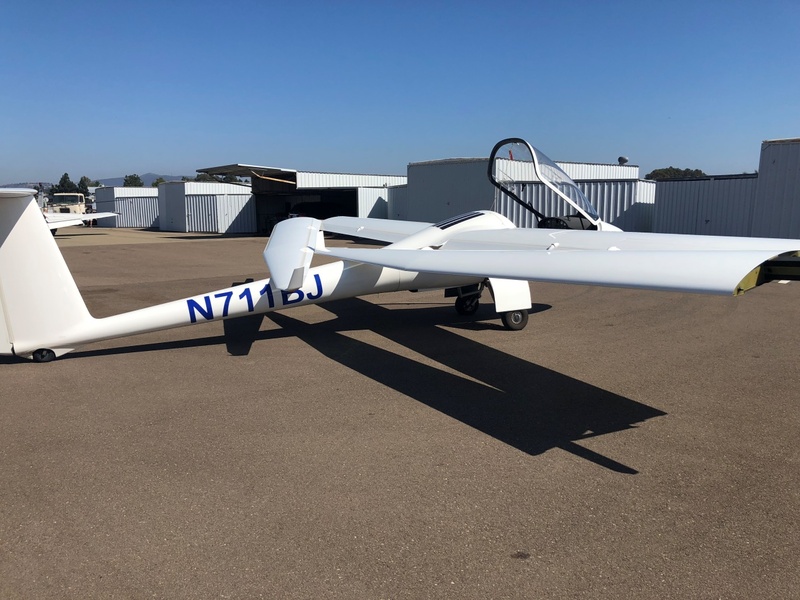 First of all, I recently was approached by a couple of pure sailplane friends who wanted to purchase a Stemme but had heard numerous poor reviews about reliability and customer support. Secondly, there are several new S10 and S12 pilots in Stemme Owner’s Group who are learning the ropes on how to fly their newly acquired gliders. Thirdly, there has never been a better time to purchase a new or used Stemme than now as there are several great used buys from trusted sources and to the new S12 that continues to be a good value. Lastly, the naysayers that I always seem to find out (mostly soaring pilots) there telling me how unreliable our gliders are, yet I am to still meet one who has any experience flying, maintaining or fixing Stemmes. The week of September 17th started a little on the rocky side for me as I had some issues in my business that managed to stress me quite a bit. By Thursday I began to check weather information at my favourite site skysight.io. By the way, for those of you who haven’t tried Skysight, make sure you give it a good try. In my opinion, it is hands down the best cross country weather software available. This tool provides accurate and valuable information required in any cross country flight. In any case, the forecast was showing a nice cloud street for Saturday in the east San Diego area extending from Jacumba in the border with Mexico to San Jacinto Mountain in the Palm Springs area at an elevation of roughly 10,000 ft MSL. While that is not by any means a crazy fantastic forecast, it would be have been good enough to practice some cross country flying locally. So on Friday I checked the forecast again but by mistake I had opened up the scale to include Arizona. To my surprise, there was a giant cloud street that was supposed to develop around noon approximately 50-70 miles east of Twenty Nine Palms high in the high California desert. Lucky for me, Skysight was showing conditions to start developing as early as 10am in San Diego. With that forecast, I called a couple of friends and invited them for a long flight, possibly an all out cross country flight to take me to either Grand Canyon or Utah. Unfortunately, nobody was available and I ended up flying on Saturday all on my own. Any successful cross country flight requires several factors to go in your favour. The first one of those key factors is a supporting family, more specifically a very understanding wife. Luckily for me, I got one! She provided full ATC clearance for the flight. Then, you need to have weather in your favour. Checked, weather looked good. Then you need to have the time and desire to go the distance to unfamiliar territory, checked on that. And finally, you need to have the tool for this kind of adventure. Oh yes, we all know we have the best cross country, mile eater, smile maker, adventure seeker machine: The mighty Stemme S10-VT.
Benedict are a must. Then I pack all kinds of crackers, ginger candy, electrolytes, etc. Just mention this because I know there are still people that get motion sick. I showed up at Palomar airport in Carlsbad around 8.30. Went through my check list routine, clean the wings, check engine and pulled the glider. For some reason by 9 I look east and see this beautiful cloud street forming at what seem to be around 9k ft. That’s when the rushing begun. I could not believe clouds were streeting in September at 9am. Glider is now set up and I am up in the air before 10am. By 10.15 am, I am motor off, climbing already in Julian through 7000 ft in a 3 knot thermal to take me to cloud base right around 10k. At this point there is like 20+ gliders in Warner Springs in line to get towed. I later learned that many of those guys took close to 90 min to get airborne. This is one of the areas where owning a Stemme is a huge advantage. 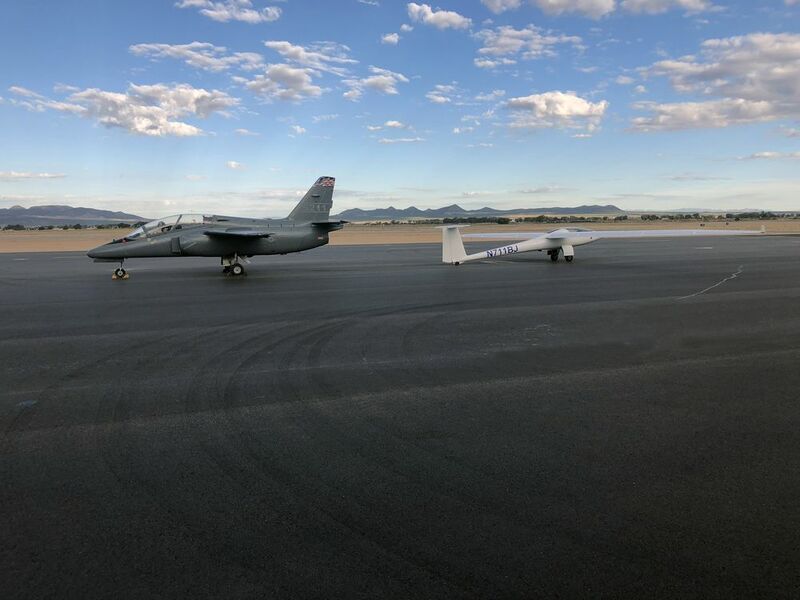 Most of the guys in that glider line drove from one to two hours to arrive at the airport, then it takes a minimum of another hour to set your glider up, then you need to wait in line to get towed. And if conditions are great, most of these gliders never go anywhere because trailering a glider back from hundreds of miles away is a huge pain in the neck and a multiday adventure. And to top it off, many of these modern gliders still cost the same or even more of what a used Stemme cost. So why bother? In the next 90 minutes after I started soaring, more than 20 gliders showed up but by then I had gone South to close to the US-Mexican border (and no, I didn’t see the wall yet) and was heading north bound heading to Palm Springs. Once in Palm Springs the sky looked good east but the jump was at least 50+ miles and I didn’t feel it was a good idea. Skies to the north didn’t look good at all. So for the first time since I started flying, I stayed in San Jacinto mountain (tallest peak in South California) for about 30minutes waiting for a sign to jump east. And the sign came in the form of a beautiful little puffy cloud close enough for me to make the jump. Once I got to it, I climbed to 10-11000 and never looked back. From there on I set mini goals. 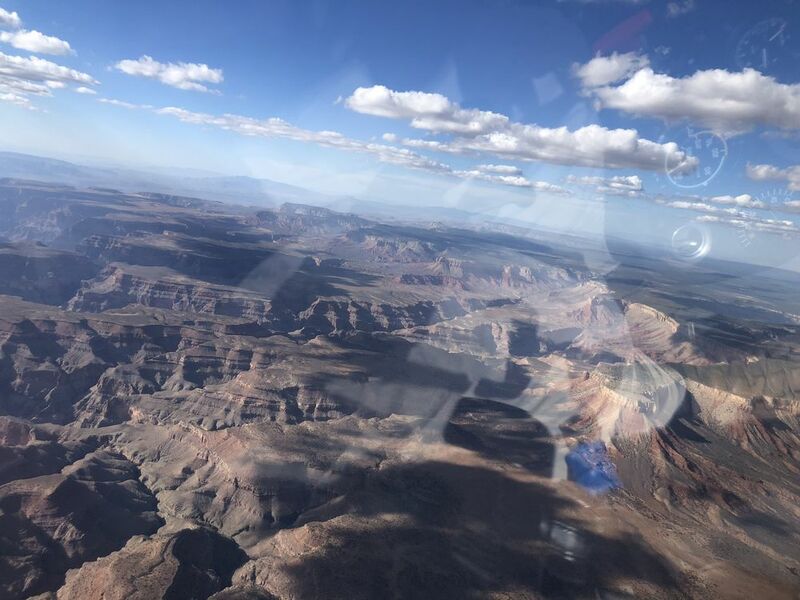 First one being Lake Havasu, once there clouds look truly spectacular with a direct heading to Phoenix but there is so much restricted airspace there that I decided to aim slightly east of LV direct to Grand Canyon. 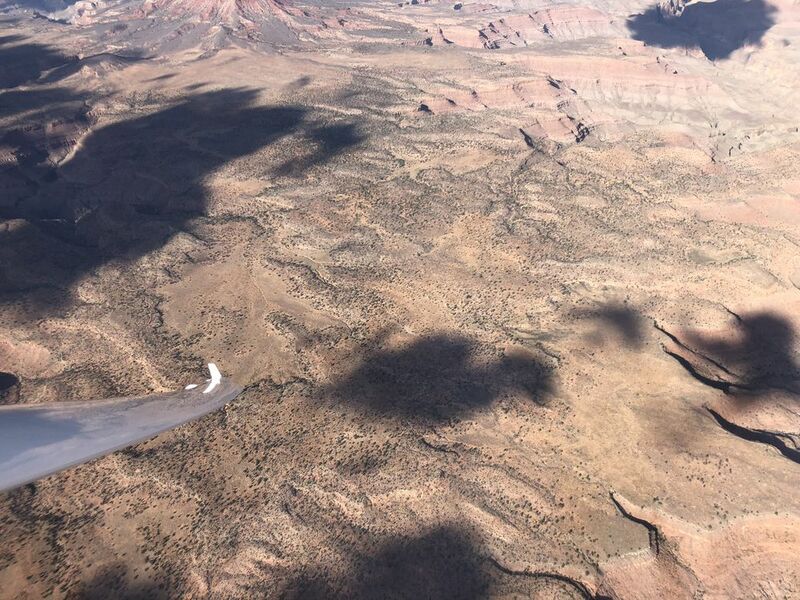 This was my first flight to Grand Canyon coming from the west and my third flight over Grand Canyon from any direction. The views from the Stemme down Grand Canyon are one of those pleasures that few people get to enjoy. Getting over Grand Canyon was challenging as I was at the edge of the height limit on the western limit of the park. At one point I only had a glide by 500ft over the IP to one airport but luckily I found what started as a very little thermal that made gain 100 then 200, then 300, 1000, 2000 and boom out I went. From that point, I sat underneath a cloud street and made my way across the National Park. 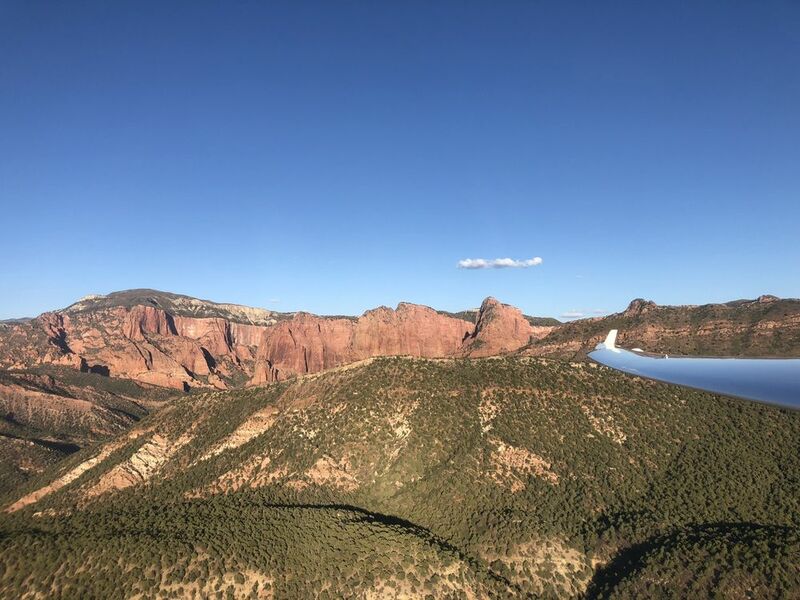 To make this a shorter story, I basically went from Grand Canyon to Cedar city, Utah where I landed. The FBO there is always great and drove me to a near hotel where I took a needed shower and warm dinner. The following day conditions were not good and I wanted to be home with my wife and kids so I got up at sunrise and motored all the way back. In retrospect, I should have gone more east south east towards Bryce canyon. If I did, the flight would have been at least 900+km. All in all it was a spectacular flight through three states and a National Park. I found no gliders, no radio chat, nothing. It was the elements, the unknown, my beautiful BJ and I. This flight was the longest flight out of San Diego county in 2018 and my flight last year from San Diego to Tonopah was the longest for 2017. There are no aircraft on the planet that can do what our Stemmes do. I hope that next year when the season starts, more owners put their S10 and S12 to their paces.